Does it sound bad if I say that I wasn’t expecting to enjoy this book so much? I guess part of me thought that I would be faced with a candyfloss style read what with the title being what it is, however I have to say that I couldn’t have been more wrong if I tried! 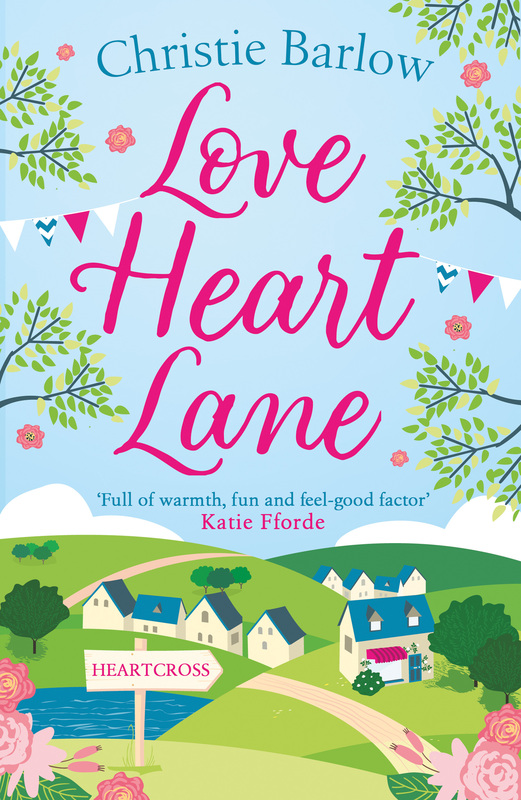 ‘Love Heart Lane’ isn’t some ‘sweeter than candy’ type of novel in the sense that makes you eyeroll, its actually the complete opposite. Felicity left her home village to start afresh in the hustle and bustle of London. Even though she missed her family and good friends, she couldn’t seem to brush off the emotions behind her real reasons for leaving. Until now. For some things, Felicity’s visit is a little bit too late, yet for other things her visit could be the start of something new. And by that I don’t mean the new bridge! So yes, as I was saying, this novel is such a tender, gifted read which made me grin from ear to ear with happiness. There was nothing in the storyline which appeared false as, fictional they may be, all of the characters appeared to be genuine. I could tell that a lot of love had went into creating such colourful characters – I sure had my favourites! I loved the community atmosphere and the sense of forgiveness, despite how many years had passed since emotions were frayed and relationships and friendships were tested. It gave me such a good feeling watching the villagers all come together, thus being the perfect moment for me to think ‘you know what, the title totally fits’. And it does. 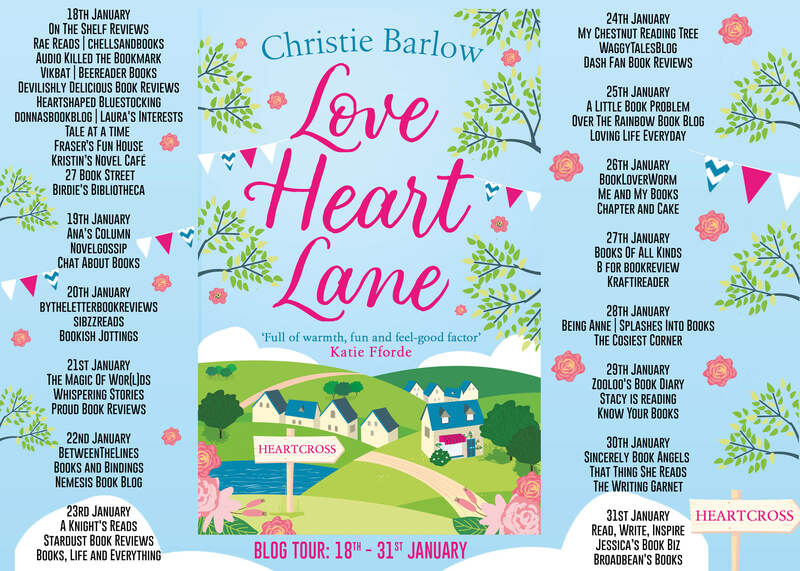 I am so very pleased that my original thoughts of the book were completely and utterly wrong, as ‘Love Heart Lane’ was such an uplifting, magnetic, huggable read which left me wanting more. If you’re after a novel which makes you feel like you’re floating on air, surrounded by duvets and pillows, whilst also filling your heart with joy and gratitude, then this book will be right up your street….well, or lane like the title suggests. OMG LEAH’S EX IS AN ABSOLUTE END OF A BELL AND A COCKEREL OF THE BANKER WITH A W, VARIETY!!!!!! -breathes-. Sorry. Who the heck does that?!?! Well, clearly he did but geez. I would say that I have no words but clearly I had a few above ha!! I’m glad to have gotten that off my chest. So. Leah has tried her best to make a wonderful life for herself and her little girl, so much so, she ends up winning a travel blogger award! If Leah thought that she was busy before the win, she had no idea just how much has blog would blow up after the win. As weird as this sounds, I was so proud of her and what she had achieved whilst also bringing up her little girl herself. Yeah there were times where Leah felt like she couldn’t cope, but she kept going because she wasn’t going to be the second parent to walk out of her daughter’s life. Like most, if not all, Linn.B.Halton’s novels, there is a man involved in this storyline, one which Leah ends up meeting unintentionally and finds that her world gets shaken up quicker than James Bond’s martini. I adore Linn.B.Halton’s delectable storylines, and ‘A Greek Affair’ certainly was no different. Each of the characters were written from the heart, with so much care being taken as they were being created and their lives being built. I will admit that there was a character who left a sour taste in my mouth, aside from the god awful ex that is. Look, I was so happy for Leah, but there was something about the man who stole her heart which left me feeling nervous. Hopefully I don’t give anything away here, but the way he was so indecisive, needing to be convinced that Leah was the right way forward made me feel like he was being fake. You shouldn’t have to convince someone to be with you or make time for you. I wholeheartedly understand that he had his own personal issues, but he seemed to say one thing yet do something completely different, before changing his mind altogether. Personally, I thought that the story was brilliantly written and I loved having such a strong, empowering woman as the main character. That said, I do think that the round-up, latter section of the novel wasn’t on par with the rest of the book due to the man in question. I actually think that ‘A Greek Affair’ could have come to a perfect conclusion whether he was there or not – his fakery annoyed me and I knew that Leah was far better than that. Overall, ‘A Greek Affair’ left my heart cosy and my giggles exercised. A lovely, lovely, up-lifting novel, perfect for empowering readers everywhere. reserve the right to select an alternative winner. Open to all entrants aged 18 or over. and will not be shared with third parties, with the exception of the winners’ information. Linn won the 2013 UK Festival of Romance: Innovation in Romantic Fiction award; her novels have been short-listed in the UK’s Festival of Romance and the eFestival of Words Book Awards. Living in Coed Duon in the Welsh Valleys with her ‘rock’, Lawrence, and gorgeous Bengal cat Ziggy, she freely admits she’s an eternal romantic. Oh I do love a Zara Stoneley novel!! I love how I can always count on this author to transport me into a storyline which not only makes me unattractively snort at high decibels, but also makes me look at things in a complete different (let’s not forget ‘logical’) manner. I have noticed that the last couple of Zara Stoneley’s novels have had more of a relaxed feel to them, and I just love how that has made the author bring her trademark humour to the surface in a way which would make readers go; ‘omg she didn’t just say that’, in regards to her characters. Take a look at Sarah in ‘No One Cancels Christmas’ and her award winning customer service for example – that character highlights what you shouldn’t really call someone you have never met before, in the most realistic way ever. Seriously. How many of us have sat at our desks or stood behind counters and have been faced with a customer or client who raises our blood pressure? And how many of us have thought one thing but said the other due to the fact they had had a utility bill through the mail, or the kid had just purchased something on the iPad because £250 was a bargain, all because we couldn’t lose our jobs? Yeah, well, Sarah says those things you shouldn’t really say, and she owns it like the colourful peacock she is! Wait. Understatement of the century. Sigh, okay I cried, and no I am not ashamed. I found that watching Sarah’s barriers come down, was such an emotionally rewarding experience as I got to see a side of her I had never seen before. There is a lot more to ‘No One Cancels Christmas’ than Sarah’s pitiful picnic skills, but trust me when I say that this storyline is like a treasure trove. A never ending one at that. Honestly, every time I turned the page I felt as though I was being given a gift! It certainly takes a special kind of author who is able to pull that off and Zara Stoneley did with ease and grace. Once again Zara Stoneley has shown me that there is more to people that meets the eyes, and finding out how someone ticks is all part of the journey, regardless of how long it takes. ‘No One Cancels Christmas’ is one of the best festive reads I have read so far this year (I’ve read a few! ), with its Christmas spirit, family rifts and enough food to warrant putting Slimming World on speed dial. A beautiful, laugh out loud novel which ticked every single box of candy canes and more – I absolutely loved it. A fantastic, festive treat that is guaranteed to keep your fairy lights on this Christmas! I write about friendship, dreams, love, and happy ever afters, and hope that my tales make you cry a little, laugh a lot, and occasionally say ‘ahhh‘. As soon as I spotted the cover of Jane Linfoot’s latest novel on social media, I just knew that I had to curl up and read it! Look at it, isn’t it beautiful?! It has been a week or so since I last took a trip to Cornwall in my pyjama’s, and despite having been to several trips to Cornwall in the fictional sense already this year, I was weirdly missing the rather popular setting! Having loved Jane Linfoot’s previous wedding series, I had very high hopes for ‘The Little Cornish Kitchen’! I think I burst out laughing after just a few pages! One word – mermaids. Enough said. Obviously mermaids themselves aren’t hilarious, but the way in which Jane Linfoot incorporated the majestic sea creatures into her storyline was brilliant and very funny. See for yourself! I did really enjoy this book, and I am so pleased that I was able to lose myself in another of Jane Linfoot’s addictive storylines. However, I found it very hard to relate to the main character and the storyline itself. I thought Clemmie’s personality was very fiery and made for such fun reading, but I couldn’t help feeling as though something was missing. For me, ‘The Little Cornish Kitchen’ had Jane Linfoot’s trademark humour, her loveable way of writing, as well as her clever way of incorporating humour and depth into multiple situations – I just wished that I could get into it as quickly as I did her previous books. I loved the fact that this author made my stomach rumble, despite sweet treats not being my go to thing, and I thought that her creation of multiple diverse characters was very well thought out. ‘The Little Cornish Kitchen’ is a very tantalising, colourful, and laugh out loud read which will make you feel like channeling your inner Mazza Bezza….or Paul Hollywood. Just make sure you don’t leave a path for a dog….just saying! seeing cow noses over the garden wall, she’s happy she can walk to a supermarket. and credits her characters for creating their own story lines. she wants to be really scared, she rides a tandem. despatch or delivery of the prize. I have something a little bit different for you all today, as I have already had the pleasure of reviewing ‘The Secrets of Villa Rosso’, I will be doing a character review of main character, Ellie, instead! Thank you to RaRaResources for the blog tour invite, and to both her and the author for allowing me to do something different for my tour stop today. Enjoy! rambling vines that cover Villa Rosso. this idyllic villa and those who have walked through its doors? So, Ellie, a character who is bound to get readers talking for various reasons, but just how far can I delve into those reasons without giving anything away? Easy peasy lemon squeezy! Ellie has been asked to go on a business trip to Italy, and of course she agreed. Who wouldn’t? What Ellie didn’t bargain for was a connection to local man, Max Jackson. Ellie is someone who doesn’t quite know her true worth, especially when she has a husband at home who seems to want to knock his wife’s confidence, instead of being the cheerleader she so desperately needs. Personally, I had everything crossed that Ellie would see sense where her husband was concerned, by telling him where to go so that she can live the life she unknowingly wants. I loved how bubbly and warm-hearted Ellie’s personality was; it was really difficult not to fall under her spell! No wonder Max Jackson was awfully taken with her! Although to be fair to him, Ellie is an extremely determined woman, so I can’t exactly put all of the blame onto him. I don’t think that Ellie is one of the strongest characters Linn B Halton has written, but she is definitely one that will leave a mark for a lot of readers. I’m all for independence, so when Ellie chose to go to Italy, I felt a different side of her personality come alive. It’s just a shame that she hadn’t felt comfortable to dust the cobwebs from that particular side around her husband. All in all, I thought that Ellie was a fun character to read about, but one who also showed signs of low self-esteem towards herself, and nervousness towards her future. Buy ‘The Secrets of Villa Rosso’ – now! the Keane Kataria Literary Agency. been short-listed in the UK’s Festival of Romance and the eFestival of Words Book Awards. she freely admits she’s an eternal romantic. Poppy won’t be told what to do by an arrogant Frenchman – no matter how kind and gentle he is to her dogs! If you’re after a bit of girl power, look no further as Lorraine Wilson has upped the ante in that department, that’s for sure!! I adored this book pretty much from the beginning, as the author seemed to connect with her readers on an emotional basis when we first meet Poppy. Unfortunately for Poppy, luck wasn’t on her side and everything she thought she knew was taken away from her in the blink of an eye. Any plans she had made had to be rearranged, putting her newfound life in a spin before it’s even begun. It was from that moment where I knew that Poppy was going to be an incredibly special character. Thankfully Lorraine Wilson didn’t allow my opinion to falter throughout the story. Due to the rough start Poppy had in her new life, she was determined not to let anyone get in the way of her future happiness, especially a charming vet! I say charming, Poppy may say arrogant and I’ll agree, because at first he was the type of person I would walk away from. Yet there was something about him which made me feel as though he was being led by a personal barrier. What that may be, however, I had no idea. ‘Poppy’s Place in the Sun’ is such a feel-good, smiley read which left me wanting more. Not only that, this book contains dogs and oh my goodness, they are a HOOT! I couldn’t stop laughing at their antics and, whilst Poppy and Leo were very endearing characters, I couldn’t help but be bowled over by the personalities of the fantastically named pooches. Despite the vibe of the book being quite romantic, the author doesn’t shove it down your throat. Funnily enough, even though I enjoy reading romance novels, I am the least romantic person ever so I did appreciate the romance element being a bit rugged. For me, it added depth to the storyline as I was excited by what may or may not happen, without things being evident from the onset. I won’t be forgetting ‘Poppy’s Place in the Sun’ anytime soon as it is such a wonderful read. Lorraine Wilson is an incredible storyteller, creating stories which hug you from the inside out and warm your heart like a coal fire on a winter’s day. A truly enchanting and feel-good novel, I absolutely it! The Royal Wedding is nearly upon us, and what could be more apt than ‘The Wedding Date’ by Zara Stoneley! Even though I have already reviewed this book independently, I jumped at the chance to be involved in the blog tour organised by RaRaResources, by sharing my review for a second time. And, seeing as this book is ABSOLUTELY FABULOUS, I think it deserves being put in the spotlight multiple times. Born in a small village in Staffordshire, Zara Stoneley wanted to be James Herriot, a spy, or an author when she grew up. Writing novels means she can imagine she is all these things, and more! Zara’s bestselling novels include ‘The Holiday Swap’, ‘Summer with the Country Village Vet’, ‘Blackberry Picking at Jasmine Cottage’ and the popular Tippermere series – ‘Stable Mates’, ‘Country Affairs’ and ‘Country Rivals’.